HONG KONG, 10 Nov, 2009 - Advanced Card Systems Ltd. (ACS, wholly owned subsidiary of Advanced Card Systems Holdings Ltd., SEHK: 8210), Asia Pacific's number one supplier of PC-linked smart card readers, today announces that it received the 2009 Best Practices Award “Product Quality Leadership Award for Smart Card Readers” from Frost & Sullivan, a global individual research and growth consulting company. Mr. Patrick Chu (Engineering Manager, pictured below) accepted the award on behalf of the company in the 2009 Frost & Sullivan Asia Pacific Best Practices award ceremony at Hilton Kuala Lumpur in Malaysia on 05 Nov 2009. This distinguished Frost & Sullivan Award for Product Quality Leadership is bestowed upon the company that has demonstrated superior quality control over its competitors in product research and development and manufacturing. Quality control is an essential element of satisfying customers, increasing repeat buying behavior, and assuring long-term market survival. To select the Award recipient, Frost & Sullivan's analyst team first tracked all products and research and development projects within the industry via interviews with market participants, end-users, distributors, and extensive secondary and technology research. After comparing and ranking different products on the industry’s quality standards, ACS was ranked as number one ahead of other smart card reader providers and hence was awarded. "I am so delighted that ACS is honored and our product quality is well-recognized in the industry. This achievement has proven ACS’s determination and dedication in developing and supplying high quality products," said Patrick Chu, Engineering Manager of ACS. "In addition, I would like to thank our engineering, production and operation teams who always keep a straight and high standard in the product quality assurance." "Advanced Card Systems Ltd has been able to deliver products and services of the highest quality over the years in response to the changing market dynamics. The continual growth in terms of market penetration and technology innovation is a testament to the company’s core values and has allowed the company to be one of the market leaders in the smart card readers market," said Navin Rajendra, Senior Research Analyst, Asia Pacific Smart Cards & Auto ID, Electronics & Security Practice, Frost & Sullivan. For further information of the Award Presentation, please refer to the video below. 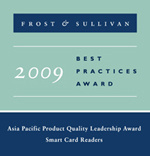 Advanced Card Systems Ltd. (ACS, wholly owned subsidiary of Advanced Card Systems Holdings Ltd., SEHK: 8210), founded in 1995, is Asia Pacific's number one supplier of PC-linked smart card readers (Source: Frost & Sullivan). 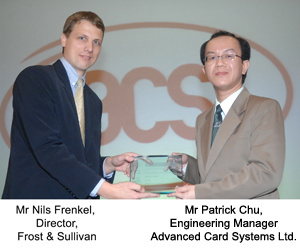 One of a select group of global companies at the forefront of the smart card revolution, ACS develops a wide range of high quality smart card reading/writing devices, smart cards and related products and distributes them to over 100 countries worldwide.Visit ACS at http://www.acs.com.hk/.